HUGE PROFITABLE REPORT IN CPL FINALE AND VERY ACCURATE REPORT IN SL-PAK TEST MATCH ALSO..99% ACCURATE REPORTS IN AUGUST..ONLY ONE MATCH WRONG TILL DATE..NOW NEW PACKAGE ENTRY OPEN FOR NEXT 30 MATCHES..
Hum is post mein apne last 2 match ki reports ka status update kar rahe hain. CPL final aur Sri lanka- Pakistan 2nd Test match dono mein humari report bang on target yani bilkul accurate rahi. CPL final mein humne apne clients ko Semi-Jackpot report di aur 35 paise ka ghoda diya. 1. 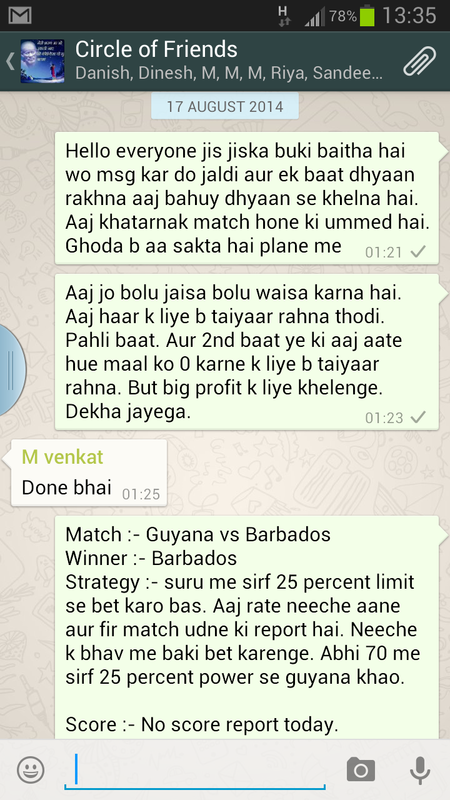 CPL Final – Barbados vs Guyana :- Is match mein humne Barbados win ki report apne clients ko di thi. Humne unhe ye bhi bataya tha ki aaj match low odds se turn hoga. 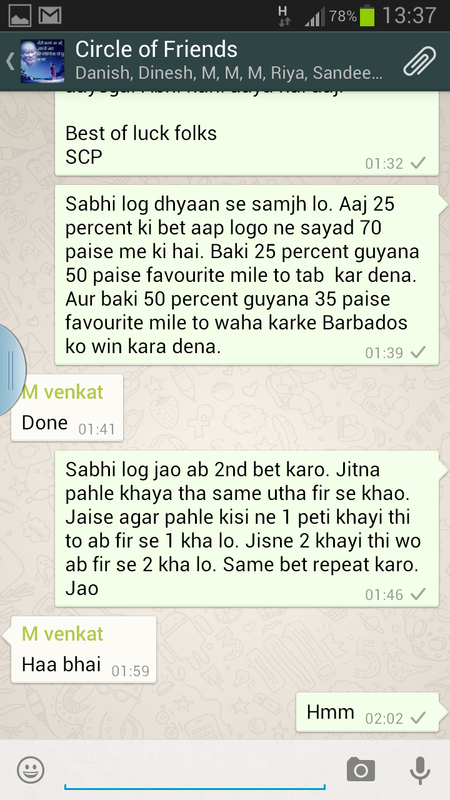 Guyana 35 paise ke aaspass tak favorite aayegi aur haaregi. Match mein bilkul aisa hi hua. Report screen shots are here below..
2. 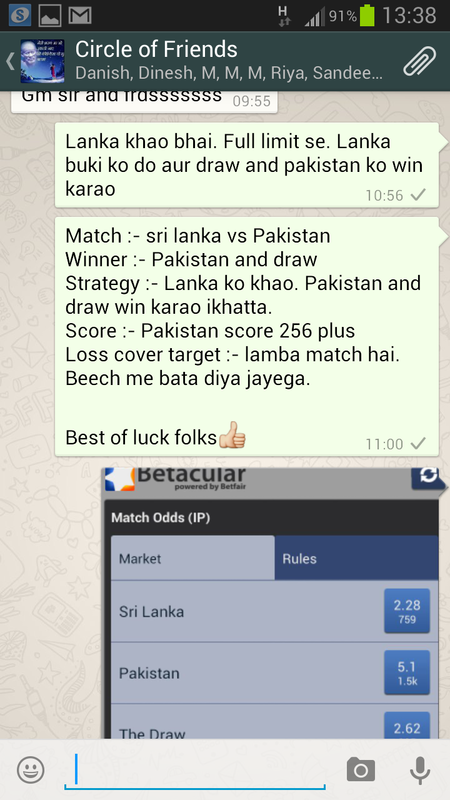 Sri Lanka vs Pakistan 2nd Test match :- Is match mein humne pahle draw par apne clients ki bet karayi thi but 3rd humare pass new update aayi ki match draw nahi hoga aur match mein result confirm hai. 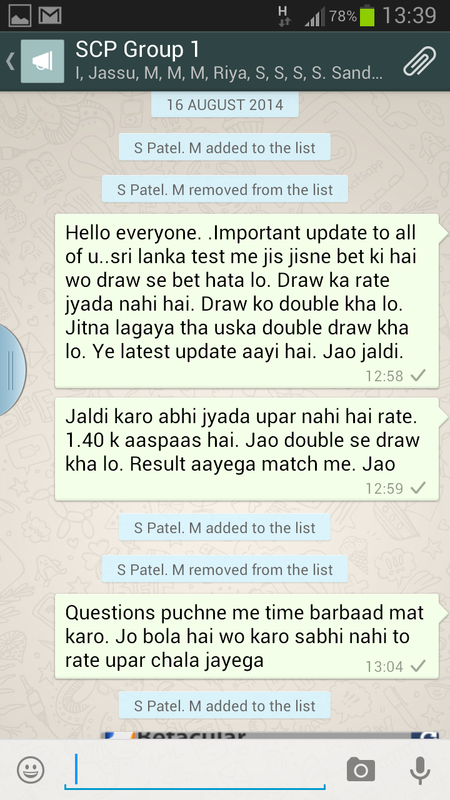 Ye update aate hi humne apne clients ko draw ko double khane yani result par double power se bet karne ki report di aur aapne dekha aisa hi hua aur sri lanka ne match win kar liya. Report screen shots are here below..
Dosto August mein abhi tak humara result 99% accurate raha hai. Pure august mein abhi tak humara sirf 1 match hi wrong hua hai jiski update last post mein humne di thi. Baki sabhi match ekdum right rahe hain. Ab CLT-20 se pahle abhi total 30 match aur hone hai aur humne unke liye new package ke liye entry open kar di hai. JAMAICA WON AS PER OUR REPORT..100% ACCURACY IN AUGUST AND CPL STILL CONTINUES…. 14 August ko morning 1.30 am ko hue CPL ke first semifinal mein Jamaica vs TNT ke match mein humne apne clients ko Jamaica win ki tip di thi. Ye bhi bataya tha ki TNT ka score 134 plus banega. Ye post hum match khatam hone ke baad morning mein 5,30 am par publish kar rahe hain. Sath hi apni report ka screen shot bhi daal rahe hain. 5 MATCH REPORTS WENT RIGHT OUT OF LAST 5 MATCH…100% ACCURACY RECORD IN AUGUST..ALL 08 REPORTS WENT SUCCESSFUL TILL DATE..ITS SCP..INDIA’S MOST RELIABLE BETTING REPORT SOURCE..
June mein 99% accurate tips, July mein 90% accurate tips ke baad ab August mein humari reports ka successful ratio abhi tak 100% hai. August mein humne abhi tak total 8 match mein apne clients ko reports di hai. 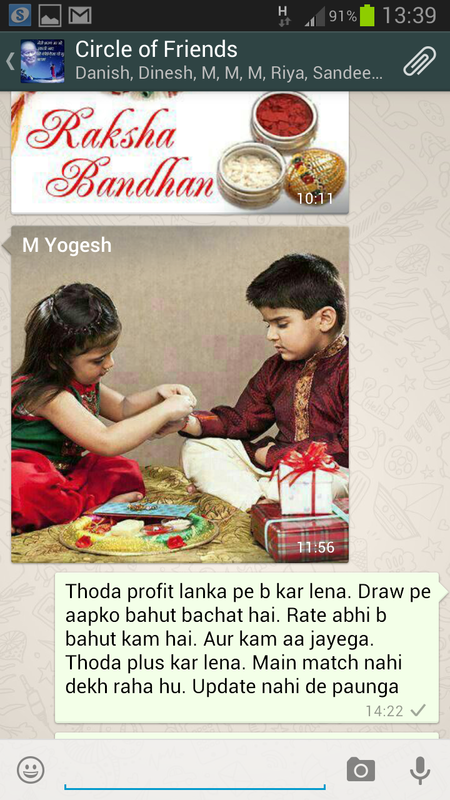 Jisme se 7 match mein humare clients ko bahut accha profit hua hai jabki 1 match no profit no loss raha hai. 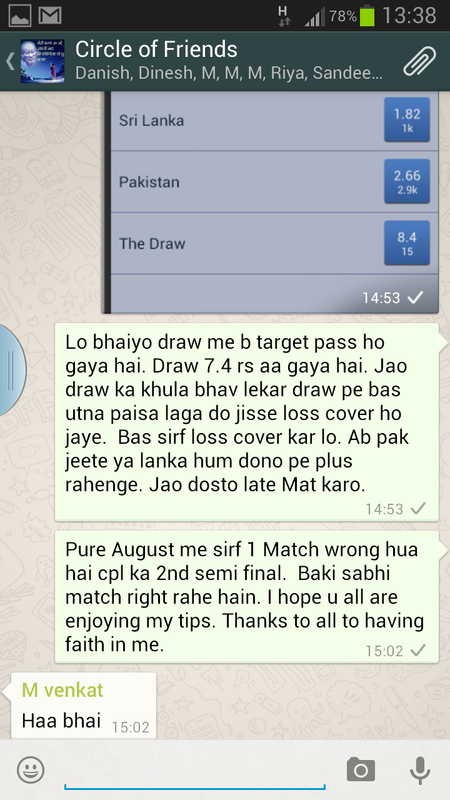 3 August tak ke matches ki reports ka screen shot hum aapko isse pahle publish ki gayi post mein dikha chuke hain. 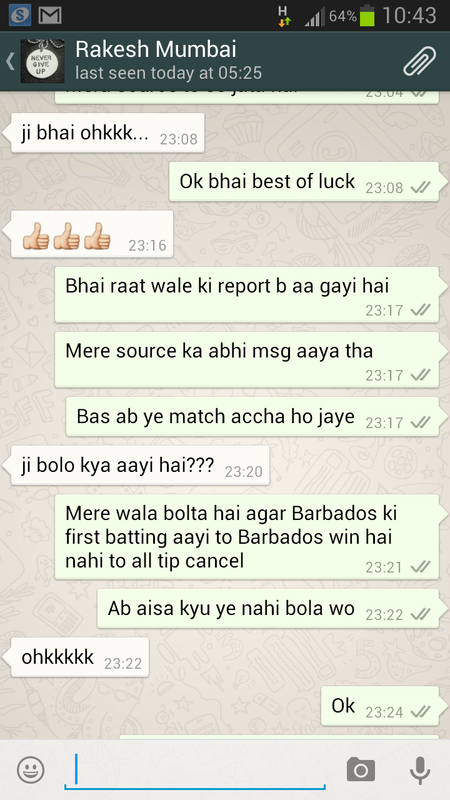 Ab uske baad ke 5 matches ki reports ka screen shot hum aapko is post mein show kar rahe hain. 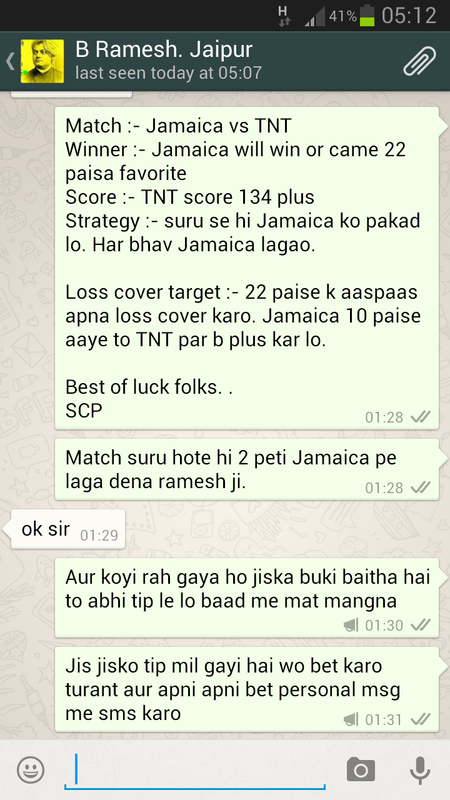 NOTE :- SCP TEAM INDIA KE MOSTLY MATCHES MEIN TIPS NAHI DETI. NOTE :- SCP TEAM EK MONTH MEIN HONE WALE SABHI MATCHES MEIN REPORTS NAHI DETI. KUCH MATCH DOUBT FULL HOTE HAIN. AISE MATCHES MEIN HUM REPORTS NAHI DETE. HUM BETTING KO EK ADDICTION NAHI BALKI EK BUSINESS KI TARAH SAMAJHTE HAIN. 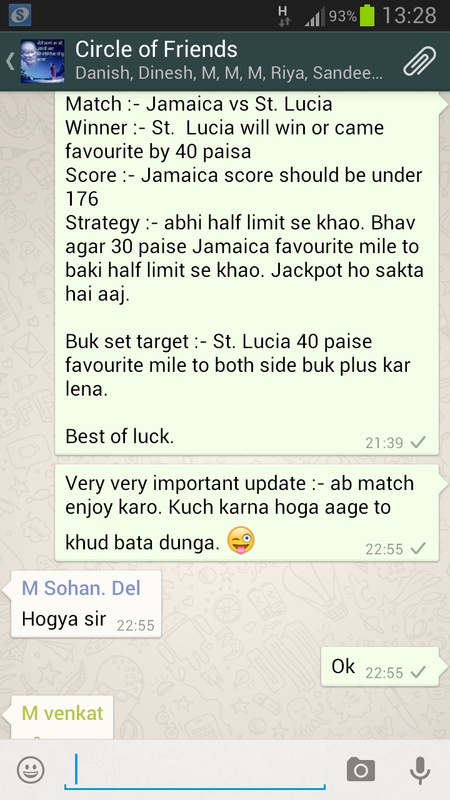 ISLIYE JO MATCH SURE SHOT HOTE HAIN UNHI MEIN TIPS DETE HAIN. 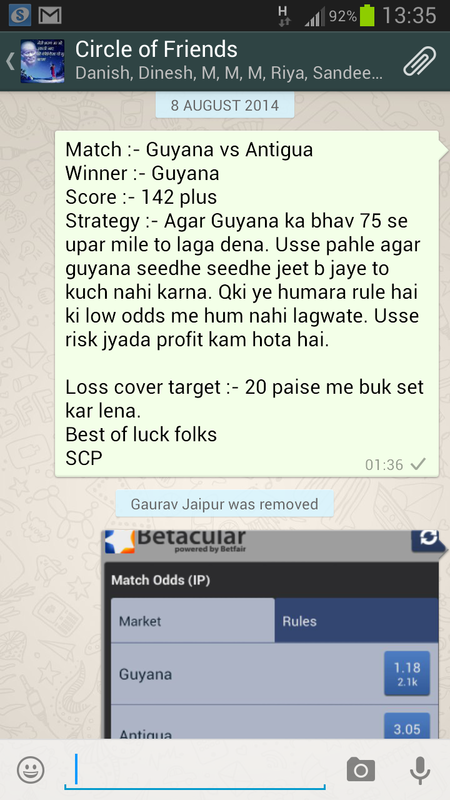 OTHERS TIPSTERS KA SUCCESSFUL RATION KABHI BHI 60% SE UPAR NAHI HOTA BUT SCP KA SUCCESSFUL RATIO 90% SE UPAR RAHTA HAI. NOTE :- INDIA-ENGLAND KE 4TH TEST, SOUTH AFRICA-ZIMBABWE KE ONGOING TEST MATCH AUR 07 AUGUST TNT VS BARBADOST CPL, ANTIGUA VS TNT 09 AUGUST CPL KE MATCHES MEIN HUMNE APNE CLIENTS KO REPORTS NAHI DI THI. 1. SRI LANKA VS PAKISTAN 1ST TEST MATCH 6 Ausust -10 August :- Is match ke first day humne apne clients ko Sri lanka ko khane aur pakistan and draw ko win karane ki tips di thi. Uske baad sri lanka ka rate 09 rs. jane par humne unka loss cover kara diya tha. 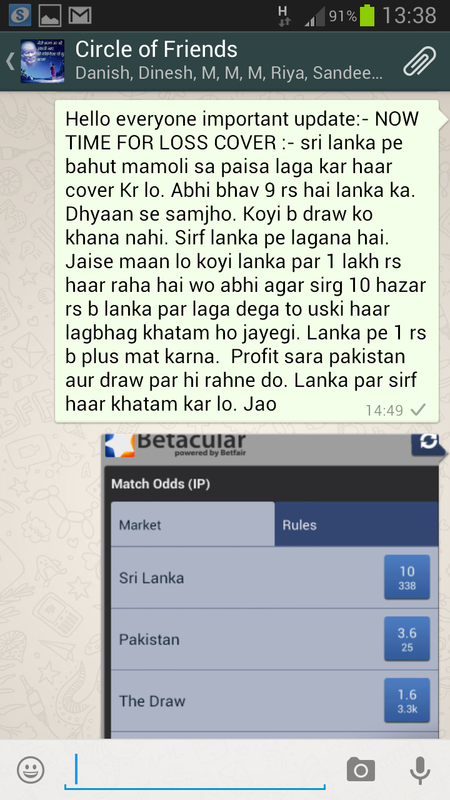 Match ke last day jab Draw 09 se 20 paise ke beech ke rate se favorite chal raha tha tab humne unhe Sri lanka par bhi plus karne ko bola tha qki humare source se match mein natak hone ki update aa gayi thi. 2. 07 August Guyana vs Antigua ( CPL ) :- Is match mein humne Guyana win ki report di thi aur guyana ne hi match win kiya. 3. 09 August Jamaica vs St. Lucia ( CPL ) :- Is match mein humne St. Lucia ke win ki report di thi aur 44 paise se non favorite open hone wale st. lucia ne hi match win kiya. 4. 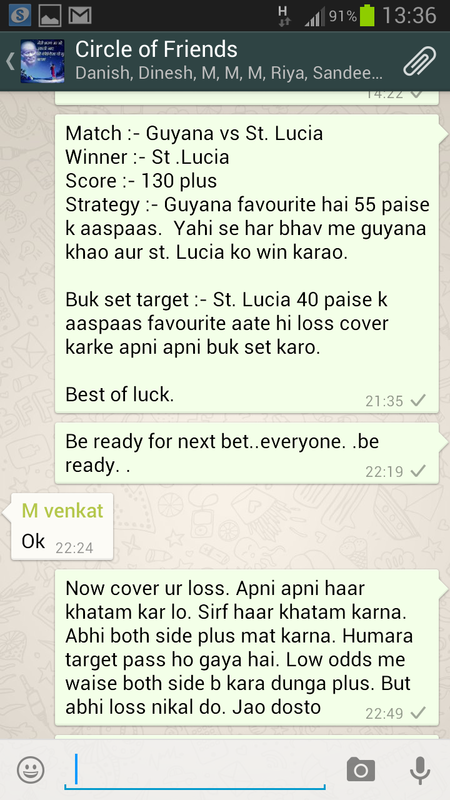 Guyana vs ST. Lucia ( CPL ) 10 August :- Is match mein humne St. Lucia win ki report apne clients ko di thi. 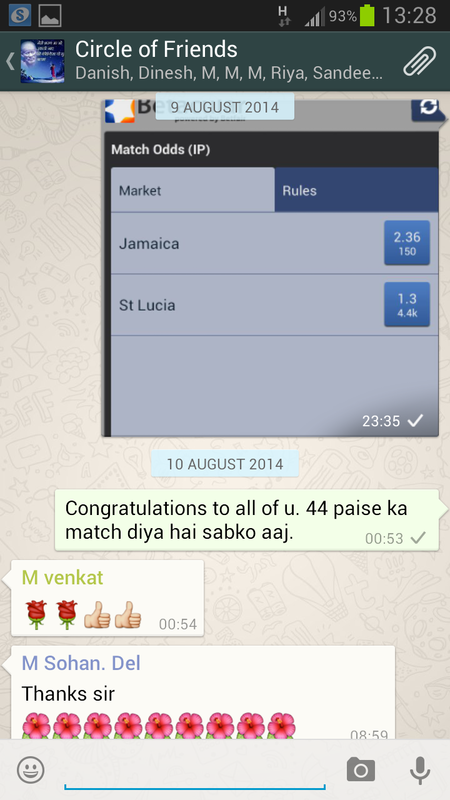 Match main open rate 48 paise Guyana favorite tha. 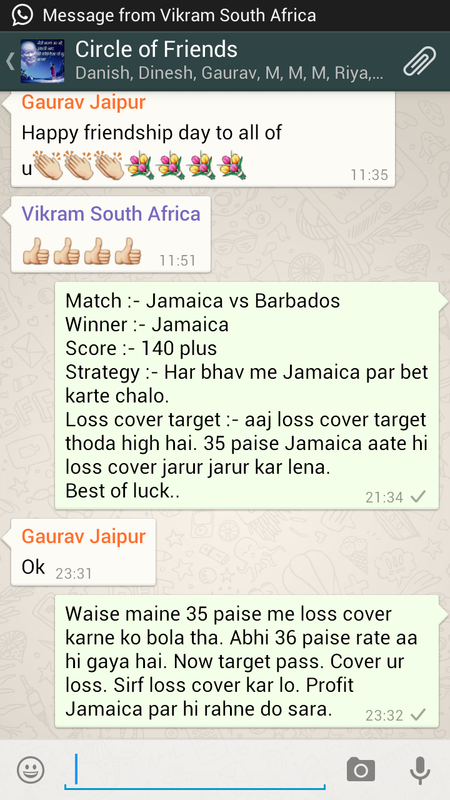 Waha se St. Lucia 50 paise favorite aayi thi jaha humne apne clients ka loss cover kara diya tha. Kuch clients ne both side plus bhi kar liya tha. 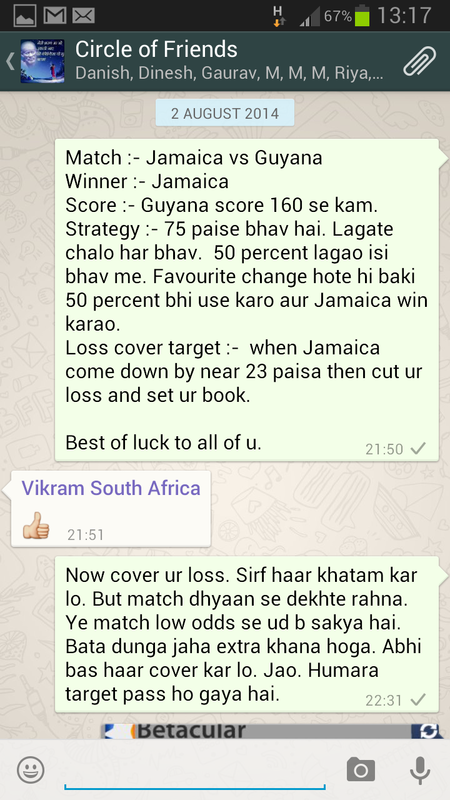 Uske baad match wapas Guyana ne win kiya but humare clients ko nuksan nahi hua. 5. 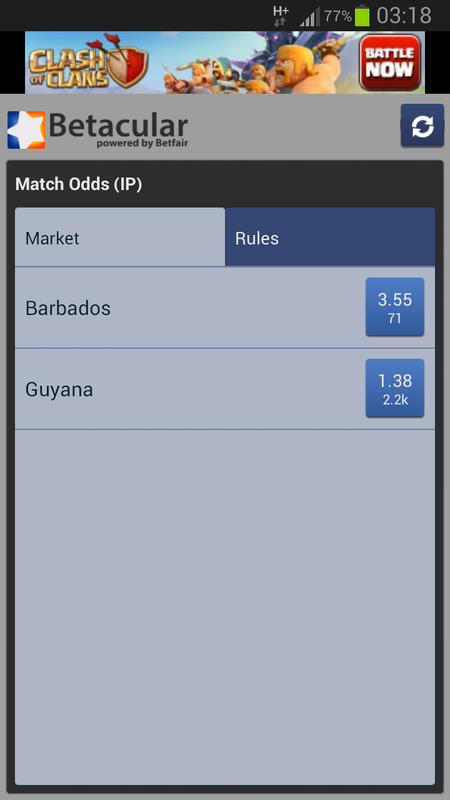 Barbados vs Jamaica ( CPL ) 10 August :- Is match mein humne Barbados win ki report apne clients ko di thi aur Barbados ne hi match win kiya. matches and in the remaining one, they did not earn or lose anything. NOTE: Usually we don’t give any tips in the matches in which India is playing. those matches. We treat betting as business rather than an addiction. than 60% but we have consistently maintained our accuracy above 90%. – 9th August CPL match between Antigua and TnT. favour of Jamaica and St. Lucia won the match. the match in the end but our clients did not suffered any loss. We gave the report of Barbados win and they won the match. Contact us for our memership. OUR AUGUST MONTH ACCOUNT OPEN WITH 100% RESULT. 3 REPORTS WENT SUCCESSFUL OUT OF 3 MATCHES..NOW 6 JACKPOT MATCH ARE COMING IN AUGUST..
June mein 99% accurate reports, July mein 99% accurate reports ke baad ab August ki suruaat bhi behad shaandaar rahi hai. August ki suruaat mein humne 3 matches mein report di aur 3 ke 3 match mein reports bilkul perfect with score and full script pass hui. DOSTO HUMARI INFORMATION KE MUTABIK AUGUST MONTH MEIN KAM SE KAM 06 JACKPOT MATCH AA RAHE HAIN JO 03 PAISE SE LEKAR 20 PAISE KE BEECH KE ODDS SE TURN HONGE. 1. 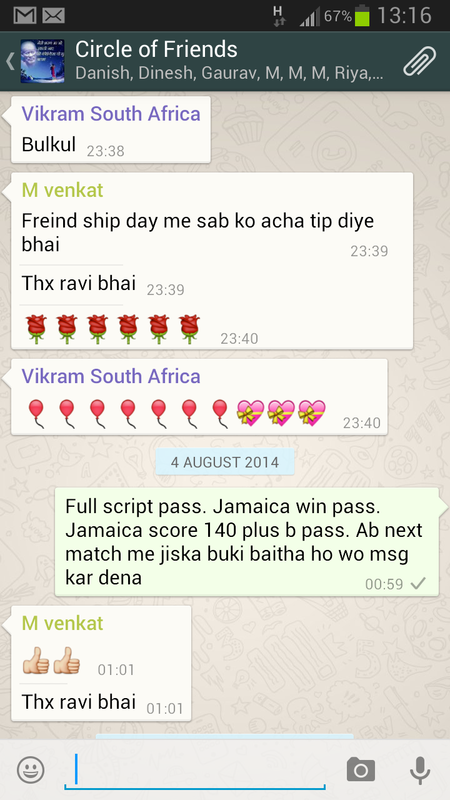 03 August :- Jamaica vs Barbados :- Is match mein humne Jamaica win ki report apne clients ko di thi. Sath hi ye bhi bataya tha ki Jamaica ka score 140 plus banega. Aap neeche diye screen shot mein is reports ka full proof dekh sakte hain. 03 August ko hi St. Lucia aur Antigua ke beech hue match mein humare paas St. Lucia ke win ki hi report thi but match mein weather hone ki wajah se humne is match mein report nahi di. 2. 02 August :- Jamaica Vs Guyana :- Is match mein bhi humne Jamaica win ki tip apne clients ko di thi aur unhe bataya tha ki Guyana ka score 160 se kam banega. Aap neeche diye screen shot mein is report ka full proof dekh sakte hain. 3. 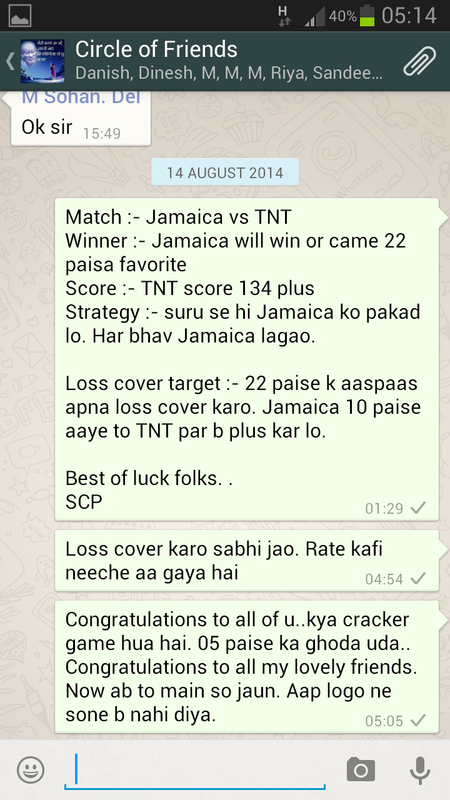 02 August :- TNT vs St. Lucia :- Is match mein humne TNT win ki hi report apne clients ko di thi but match mein koyi bhi accha bhav nahi mila. 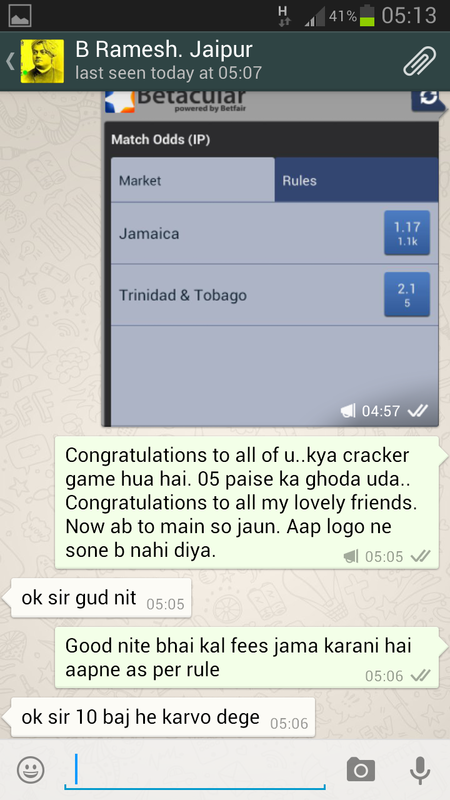 Match mein 45 paise TNT favorite khula tha aur wahi se match seedhe seehe khatam ho gaya. so koyi bhi is match mein profit earn nahi kar paya.